MEEDJ – interact with the music you love: you’re the DJ! MEEDJ is a DJ mixing console we created for people who want to easily interact with the music they love and to mix tracks like a DJ, having a simplified interface at their disposal. 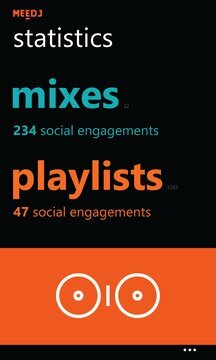 MEEDJ’s value is the interface itself (developed with a professional DJ), the social features tightly integrated within the App and the strong social engagement metrics (GetAll bundle). You are the DJ! Just load two audio tracks from your music library (or from OneDrive) and start mixing them, by jogging, pitching and applying audio effects, loops, samples… All key features are at your fingertips! If you want you may also upload your work to the cloud and share it on social media. 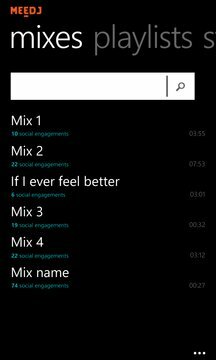 Once shared you can track (GetAll bundle) the feedback coming from social media for your mixes and playlists, thus getting an idea on how much they have been appreciated by your friends. MEEDJ is FREE for ever with Ads. Paid version (GetAll bundle) removes Ads and 15’ recording limit, includes detailed social metrics, an amazing Sample Pad, additional audio filters, cool skins and much more. Please, feel free to contact us at support@meedj.com for any feedback, question or suggestion!